Along with witnessing the remarkable eclipse itself, obviously, I was interested to see what kind of visitor turnout there would be locally for the big event. Forecasts were difficult, because there is no precedent for an event like this. It is understandable that officials wanted to err on the high side in order to avoid getting swamped with unexpected numbers. Some projections that were published locally included a doubling of the county population on eclipse day (our current population is about 225,000) and up to 40,000 people in DeSoto, at the center of the path of totality. Festus: “Near-capacity crowd” at West City Park. “A parks department guy…thought there were 4,000 people” but the fire chief thought it was higher. The police chief estimated 12-15,000 at West City Park. KMOV says Festus had over 20,000 total visitors. These number don’t include others who watched at private homes or other viewing events hosted by businesses (like Surdyke Harley or Villa Antonio Winery), churches, baseball fields, etc. Festus seems to have drawn the most local visitors, which I attribute to its location near I-55 and the fact that it advertised one site for all its festivities. De Soto had a longer totality, but their marketing was basically “here are a bunch of places in town to watch.” Festus has many more hotel rooms than De Soto, also, so that was likely a factor. I did not expect Arnold to get many visitors, since it only experienced 2 minutes 8 seconds of totality at the park where it hosted an event. People who traveled for the eclipse were going to try to get as much totality as possible (De Soto got half a minute more than Arnold), and thus bypass cities further from the center of the path of totality. And locals, I think, were more likely to avoid the crowds and watch from the comforts of home, where air conditioning, bathrooms, and fridges were available, even sacrificing a dozen or two seconds of totality in exchange for convenience. For a nearby data point, Jefferson City’s turnout was about half of what was predicted. The Leader also reports that the weekend was “peaceful and traffic congestion-free,”and that backups did not occur until Monday morning in the 9 am hour on southbound roads. There were some northbound backups after totality ended. According to MODOT, 55 South was “fairly heavy, but steady” on eclipse morning and “fairly heavy” on 55 North afterwards. This is what I noticed as well. As with many parts of the country, traffic was worse after the eclipse than before it. However, MODOT also said the traffic was “what they expected.” These results are not consistent with the department’s warnings leading up to the eclipse of massive traffic. MODOT also said that there was heavy traffic Saturday, which I don’t think we really saw here in JeffCo. In line with what Arnold said, there were not big Saturday visitor numbers. I did not see reports about attendance at Herky’s weekend events, but I did attend the parade there Saturday morning and the crowd was light. I think the vast majority of eclipse visitors came to town Sunday night or even Monday morning, in part due to the fact that our county’s limited hotel room inventory was all booked up. Even in Carbondale, site of the longest duration of total eclipse, the visitor numbers were reportedly underwhelming on Saturday and into early Sunday, though things definitely picked up after that. The weather may have played some role in reducing the number of visitors to the area. Right up until eclipse morning, the forecast was for approximately 50 percent clouds over our area. Serious eclipse viewers may have decided at the last minute to head for other locales, such as the Nashville area, where the forecast was for clear skies. That’s what the head of the St Louis Eclipse Task Force did. However, it sounds like Nashville had more cloud issues than we did. From my vantage point, clouds only covered the sun for one brief moment an hour before totality. On the other hand, the forecast was worse in the Columbia and Kansas City areas, so we have have received a last-minute bump from people redirecting from points west. Again, I don’t blame anyone for overestimating how many visitors we would receive for the eclipse. I just think it is worthwhile to compare projections to reality. After all, there’s another eclipse in seven years (JeffCo residents will have to travel a bit for that one – SEMO, here I come), and we have to start planning soon. Tip #1: BUY YOUR DANG GLASSES WELL IN ADVANCE! The Monday, August 21 total solar eclipse is fast approaching, and Jefferson County has a front row seat. As one moves south from Arnold to DeSoto, the amount of time that the sun will be completely covered (totality) will increase from 2 minutes and 8 seconds up to 2:40, so the further south you go, the longer the eclipse you get to see (until you pass Desoto, then it starts decreasing again). The partial eclipse will start at about 11:45 am, the total eclipse will start at 1:17 pm +/- 20 seconds (starting earlier in the south), and the partial eclipse will end at about 2:45 pm. The red line is the path of longest duration and the blue line is the limit of where you can see the total eclipse. So much of St. Louis is not in the eclipse zone, and we can expect many visitors from up north on eclipse day, as well as visitors from outside the area. For example, Festus is anticipating thousands of people at its eclipse-day festivities, and all the hotels there are booked up. One estimate says the county’s population will more than double on August 21. So plan on traffic and crowds if you are going out in public that day, especially if you are going south. Get there early. Here is a list of eclipse activities happening in Jefferson County. The number after each location denotes the duration of totality at that site. I will update this as needed leading up to the big day. Let me know if there’s an event I should add. Note: Schools in Jefferson County are starting classes the week before the eclipse, and are scheduled to be in session on the 21st (except Sunrise, which starts the 23rd). Update: Schools have been deciding in July and August to cancel classes for the day. Only Fox and Northwest are now planning to be in session. Arnold, 2:08: Three day event with car show, fun run, science booths, kids events, and a bluegrass festival. Kimmswick, 2:20: One day of trivia, music, shops, raffles, and a live radio broadcast. Herculaneum, 2:32: Three-day festival with fun run, parade, live music, and kids activities. Herky also has an array of merchandise available (some other cities have shirts as well). House Springs, 2:34: The JeffCo Parks and Rec Department is recommending its Northwest Jefferson County Sports Complex as a viewing site. Also, the Deer Creek USA golf course will have a viewing. Festus, 2:35: Informational presentations, other unnamed activities that weekend. Hillsboro (Jefferson College), 2:38: One day event with concessions, souvenirs, and activities for the whole family. Viewing will also occur at the Civic Club. DeSoto, 2:40: A number of viewing sites throughout town on eclipse day, some with food and activities. The AmVets Post seems to have the most excitement planned. The branches of the JeffCo library will be holding events as well (Arnold, Barnhart, High Ridge). Ste. Genevieve (2:40): Music festival on Sunday, eclipse viewing with food, entertainment, and exhibits on Monday. The Leader also has an eclipse guide. P.S. – Get your eclipse glasses for safe viewing. A Washington Post article on the decline of the middle class earlier this month included an interactive infographic that gave county-level data on median income (click to enlarge). As you can see, Jefferson County median household income peaked in 1999 (at $64,610), which barely puts us among the 81 percent of US counties in which median income peaked at least 15 years ago. St. Louis County and St. Louis city, by comparison, peaked in 1969. As you see from the chart on the right side, we are consistently above the US and Missouri averages in this category. 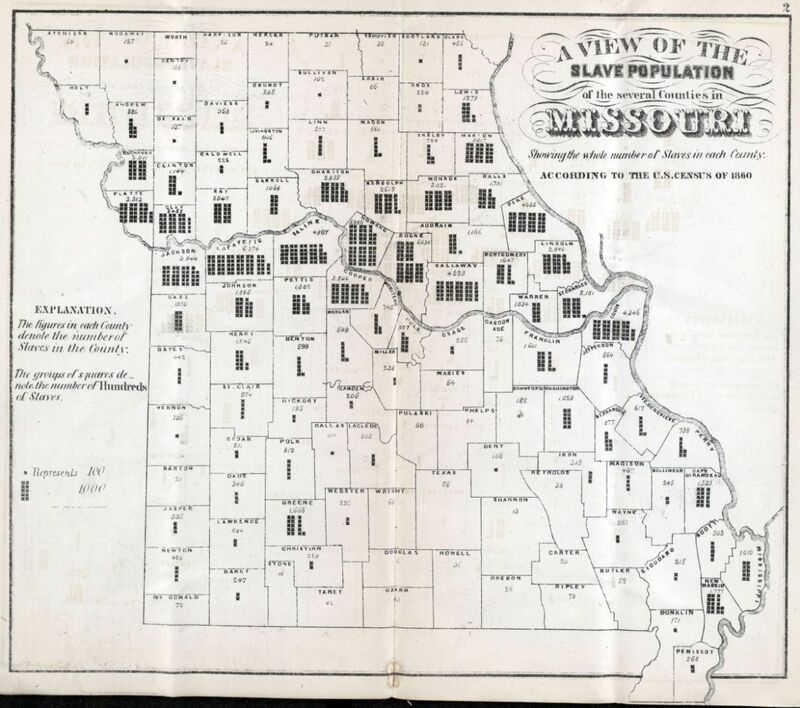 This is from a exhibit of St. Louis and Missouri maps at the St. Louis Mercantile Library, reported on by the Post-Dispatch. While the numbers are hard to read, it shows that JeffCo residents owned 564 slaves in 1860, according to that year’s Census. This, of course, was right before slavery ended. I think this provides an interesting historical note. I thought it would be interesting to break down some of the demographic data on the various cities and towns in our fair county. Using the US Census Department’s American Factfinder website, which uses data from the 2010 census as well as 2007-2011 American Community Survey 5-Year Estimates, I pulled out education and income data for each zip code in our county (zip code map here). Specifically, I looked at percentage of residents with a bachelor’s degree or higher and household median income. Note that the listing for Murphy, with the 63026 area code, also includes Fenton, which is partially in St. Louis County (see the zip code map link above). Note also that I included Clayton and St. Louis in the table for purposes of comparison. The table is sorted by descending household income. Click to enlarge. 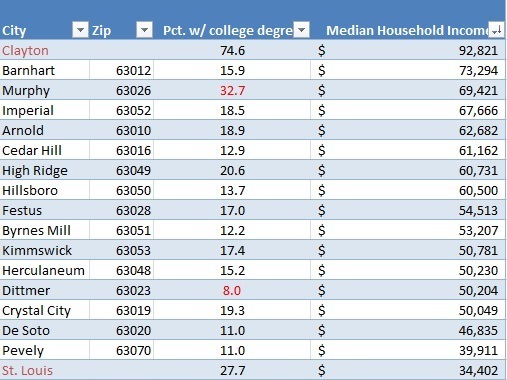 I expected to see this table more or less go from north to south Jefferson County for both categories, with the northern cities being richer and more educated. This turned out to be largely true, but not perfectly. I was rather surprised to see Barnhart at the top of the list for income at over $73,000 per household. There’s not a whole lot in the town in terms of businesses that would employ a lot of people or provide high incomes to many, but I guess people who live in any of these cities don’t necessarily work there (especially those cities closer to St. Louis). On the other end, I was surprised to see Pevely at the bottom of the list with about $40,000 income per household. Pevely has several industrial/manufacturing companies (Dow, Verallia, Midwest Refractories) that one would expect to provide good middle-class jobs. But again, maybe their employees live out-of-town. 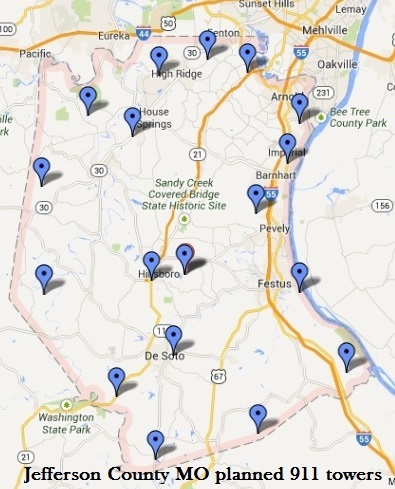 Despite being worst in the county, Pevelians still out-earn residents of St. Louis. Education was somewhat correlated with income, but again not perfectly. Murphy led the way here with a whopping 32% of residents with college degrees, to go with its #2 spot in income. Dittmer brought up the rear with 8%. Crystal City was pretty far down the income list despite its robust 19.3% rate of bachelor’s degrees, third in the county. Everyone else was in the 11-20% range. I hope to do some more with local census data. Perhaps I will look at employment data and divorce rates in my next installment. I haven’t seen anyone else do this, so I created a map of the proposed 911 towers planned for our county. Here’s a link to my Google Map, and here’s a jpg. Click to enlarge. Two of the locations are approximate, as I could not find the exact locations. One is at 2050 Blackfoot Drive in Festus, which is closer to De Soto and is labeled as Mohawk Rd on the map. The second is 642 Johnson Road, also in Festus. I put the marker on Johnson Rd, but the exact address did not come up on Google Maps. Here are some resources for finding local, natural food here in Jefferson County, for those of you who are interested in that sort of thing. Leave a comment if you have anything to add to this list. -Grass-fed beef at Missouri Grass Fed Beef. Based in De Soto, but the website mentions a farm near Salem. –Sandy Valley CSA – subscribe for the season to receive fresh produce each week from Hillsboro. Today is the deadline for this year. -Lalk Berry Farm – blueberries and blackberries near Hillsboro, 314-795-2142. -Wyciskalla orchard – various fruits near Festus, 618-513-9620. I found this information in the Crystal City Comprehensive Plan Update (p. 14) from 2009, and then I updated it using the latest tax table from the Missouri DOR. I thought I’d post as a reference. The rates below include state, county, and special district levies.